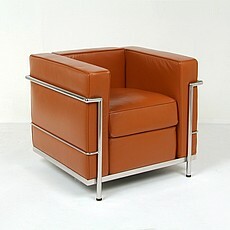 One of the most influential of 20th century architects, Chareli-Edouard Jeanneret, who chose to be know as "Le Corbusier”, was also responsible for some of the Modern Movements best-known furniture. 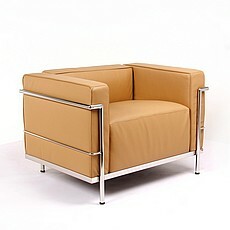 In collaboration with designer Charlotte Perriand and his architect cousin Pierre Jeanneret, he helped create machine age classics such as the LC2 Club Chair, the LC3 "grand confort” armchair, the Basculant Sling chair and the chaise lounge chair. Free from any form of decoration, these tubular steel designs embody relaxed and timeless elegance. 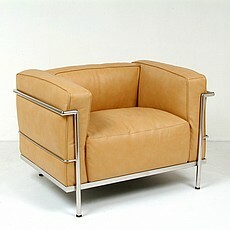 We make our own versions of the Le Corbusier style Lounge Chairs. These are made at own factory, and you will not find a finer version of this seating collection anywhere else. We use high gauge tubular stainless steel on each frame. The frame is polished to a mirror-like finish with mitered frame corners ground to a soft radius. The feet have adjustable height glides. The webbing is 2" polyester woven elastic with hooks to hold it the frames. Besides the polished frame, we also offer 6 colors of metallic powder coated finishes, or choose your own! We use top-grain, aniline-dyed leather on all visible cushion surfaces. Inside each cushion is high density, HR (High Resilient), Multi-Density polyurethane foam surrounded by Dacron batting. On the LC2 seat cushion, there is a layer of goose down/feathers on the seat top. On the LC3, the seat cushion has an extra layer of Dacron fiberfill. The LC3-relaxed uses both foam and goose down/feathers on the side and seat cushions for the most comfortable of the Cassina style chair.